Last year I said I would need to update my prediction if anything in the legal landscape changes. Nothing has really changed in the last year that would lead me to change my prediction so here is my graph with no changes to the data over last year. I have simply updated the year and placed an arrow on the X-axis to show the current point in time. As I pointed out last year, it will be kind of hard to tell how well my prediction is doing if some authority with the means to measure the actual percentage doesn’t step up and make it public. In the last 12 months no entity has stepped up to do that so we don’t have any way to accurately tell how much progress has been made. My personal observation doesn’t really count because it is totally unscientific, but as an anecdotal observation I can say that I am aware of a few more products on the market with serial numbers on them this summer than I was last summer, so the trend is upward. It feels like we are probably somewhere between my low and high lines on the graph but probably closer to the low line than the high line. That’s probably not as significant as it might sound. What might be happening is that manufacturers are still testing their initial experimental deployments and working on improving the reliability of the new processes before they replicate their systems to all of their production lines. If that’s true then we may yet see my older theory come true that the actual percentage would leap from the low line on the graph towards the high line at some point. 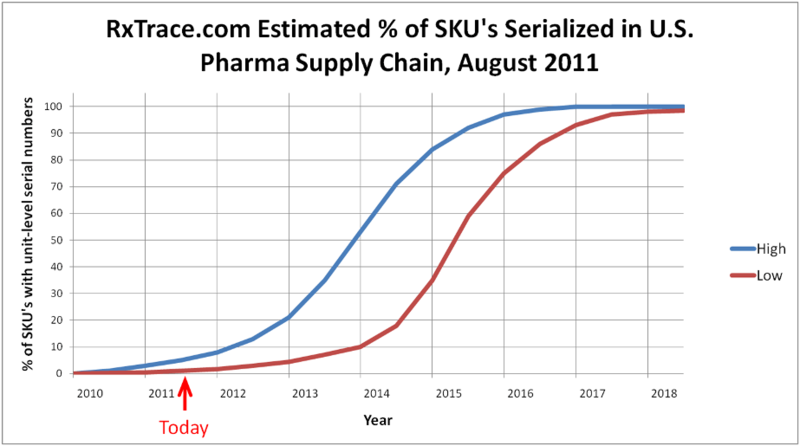 A few companies may also be adding serialization capabilities but holding off on actually turning them on until the California dates get closer as a cost containment move. A few companies have made some of their plans public, up to a point. For example, here is a great article from SecuringPharma by Phil Taylor back in January about AstraZeneca’s plans: “AZ presses on with at-line mass serialisation”. Here is an article by Stephen Barlas from the April edition of Healthcare Packaging magazine that includes information about GE Healthcare’s serialization work: “FDA’s track-and-trace workshop talks Turkey about item-level pharmaceutical packaging”. Another year has passed with only an apparent small increase in the number of drugs serialized in the U.S. market. If we’re going to get to 100% by January 2016 in California we’ll need to see a marked increase in the rate in the next few years. Keep watching for that. Agree that knowing exactly where we are is difficult. -EMRs which require will eventually require recordation of product if not lot/serial number to monitor outcomes. -ACOs which will consolidate individual practice information into larger entities and fund AIDC programs to monitor outcomes. UK MoH decision to require GS-1.